I might not be a vegetarian, but I’m definitely aware of my eco-footprint. I might actually be one of those people who get smug satisfaction in the fact that I have never owned a car, that I walk or take public transportation (very rarely ride in cabs), that I recycle, etc. But really, I’m barely doing a fraction of what I could be, and Deborah Madison’s Local Flavors has me entertaining romantic fantasies of getting up early to head down to the Union Square Greenmarket every week, eating “Slow,” etc. Since it’s spring, asparagus is on the brain, and the Asparagus and Wild Mushroom Bread Pudding seemed to leap off the page at me. I had to drop everything and make it as soon as I could. It sounded like a perfect brunch/light supper/room temp entree. I would make this for any pot luck in the future. Usually I say that everything I make or cook is easy (this is no exception—nothing was hard), but it’s worth noting that there are a lot of steps and you dirty a ton of tools, as you steep the milk, blanch the asparagus, saute the mushrooms and shallots, and then mix it all together in something big before putting it in the baking dish. It’s a great improvising dish, so you can easily make it your own. But I don’t want to get ahead of myself. You start with the bread. Now, I don’t know where the flour, sesame seeds, and whatnot are from, but the loaf was baked at a bakery around the corner. It was so good and smelled so heavenly, I slathered the ends in butter and snacked on them while preparing the rest of this meal. It’s best stale, but this was freshly made that morning, so I sliced it up thick and lightly toasted it in the oven before tearing it up and soaking it in the garlic-steeped milk. The recipe calls for a head of green garlic, but I just smashed 3 cloves of garlic. The asparagus was marked “local,” and the mushrooms are from Kennett Square (as they should be), which, while not truly local, is only 2 hours away. After cooking the veggies, everything gets mixed together with grated fontina cheese and 4 “farm fresh” eggs. I shamefacedly admit that the cheese was imported. (Baby steps!) Damn was that cheese tasty. I definitely consumed quite a bit while grating it up. I don’t think I’d ever had straight fontina—somehow, in all my cheese eating, I’d overlooked this more basic cheese. It gets melty and gooey and brought all the flavors together into a savory masterpiece. Put the garlic in the milk, bring it to a boil, then take it off the heat, cover, and let it steep for about 5 minutes. Strain the milk or just fish out the garlic, and pour it over the bread in a bowl. Give it a mix from time to time as you prep the rest. Blanch the asparagus in a saucepan of water with a bit of salt, about 3 minutes. Drain and rinse with cold water to stop the cooking. 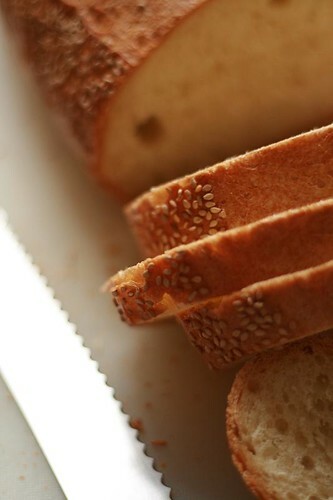 Toss into the bread. 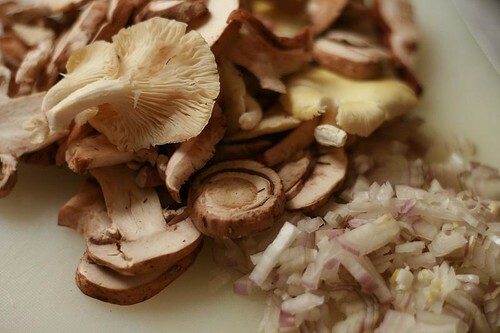 Melt 1.5 tablespoons of the butter in a skillet and cook the shallot and the mushrooms until browned and tender. Season with salt and pepper. Add to the bread. Beat the eggs in a bowl with the parsley, salt, and more pepper. Mix into the bread mixture along with 2/3 of the cheese. Pour into a buttered 8 x 12-inch dish, dot with remaining butter, and sprink the remaining cheese on top. Bake at 350 until puffed and golden, about 45 minutes. Enjoy! So go ahead, organize a pot luck party, and I’ll bake this up, walk over with it, demand that you recycle the aluminum foil I wrap it in, and will generally be that girl at the party who won’t shut her yap about the environment. But if making a meal like this—or anything else from that cookbook, for that matter—is considered doing my part for Earth? Well, let’s all go green! I need to get some Deborah Madison books. And I need to make this. Oh good grief, this looks so freakin’ GOOD. I only just had breakfast, but now I am wanting this. Right. Now. Anything with fontina in it has me sold. i don’t have the “local flavors” one but deborah madison’s “vegetarian cooking for everyone” is definitely one of my top five cookbooks! Oh my, that looks REALLY REALLY tasty!!! I’ll have to look at that book. i didn’t know how to drive until i was 38 and i didn’t own a car until two years later so i used to feel pretty smug. and then i moved to the stupid suburbs. now i just feel kind of smug for driving a little car ;). that looks really yummy by the way. bread pudding in any incarnation rocks, doesn’t. i mean, really. oooh, i loved vegetarian cooking for everyone. gotta check this one out! I really like Deborah Madison, but I don’t have that book. Clearly, I need it! I have that book too, but hadn’t noticed that recipe. It looks so good, I will definitely try it once asparagus comes into season in Wisconsin (it has to happen eventually, right?). If you don’t already have Deborah Madison’s Vegetarian Suppers book, I highly recommend it. I’m not vegetarian either, but it’s one of my favorite and most used books. Not exactly fast or easy stuff (like this recipe, it seems), but oh so delicious. yummeh. have you planned a menu for Earth Day? Mmmmm, mmm mmm. I LOVE that recipe and have made it several times. It’s excellent with multi-grain bread, too. If you don’t already have it, Vegetarian Cooking for Everyone is also a really good cookbook. If you bring that dish to the potluck, you can be as smug and haughty as you like! Mm, looks far too good to be good! God, that looks delicious. Ever since reading Animal, Vegetable, Miracle and Omnivore’s Dilemma, I try to be conscious of eating more locally. I so wish I had a little garden plot, but I live pretty close to a farmer’s market. I’ve flipped through Deborah Madison’s books and have always been a little intimidated by the amount of preparation in her recipes, but all that work just makes the end result all the more rewarding! I am really enjoying reading about all your culinary adventures! That looks so delish. I’m hungry now. Wow. That looks crazy delicious. I will have to make it. Oh wow, ultra-mouthwatering… My husband will be my slave after I make this–he is a major asparagus and mushroom fan! I can’t wait to make this while it’s still asparagus season! Damn. I don’t do mushrooms (can’t stand the texture), but that looks so amazing that I might have to figure out an alternative ingredient and make it. Yum. 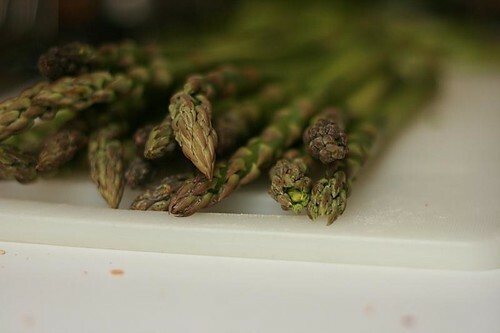 ….You just convinced me that I want asparagus. How did you do that? I’ll invite you to a potluck any day – it looks amazing, especially considering I had waffles for dinner (I’m in Quebec though…so the syrup was local at least). Is that in Local Flavors or Vegetarian Cooking for Everyone? Deborah Madison rocks my world. VCE is the best cookbook I’ve ever owned! It has this rosemary and cannellini bean soup to DIE for. OMG- that looks delish! 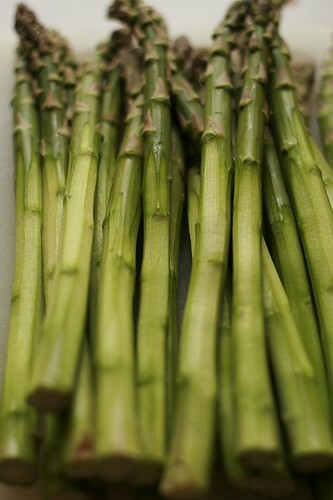 I got asparagus in the CSA box this week. I may have to break out the bread machine. (I’m in a grain CSA too!) I could get everything (almost) locally. The cheese is definitely tricky. NorCal is lucky that way but still, lots of good cheese comes from Italy. Thanks for another great idea! That looks Yum. Yay for eating local too! I try to do my part up here, and can’t wait till the season progresses and I’ll be eating things I grew myself. Thanks for the great recipe idea. Okay, so not on topic, except to note “what you’re watching” in the sidebar: deadwood. I can’t think that they wrote it this way on purpose, but as an allegory of organizations — particularly academic organizations — it borders on profound. And hilarious. Wow! That looks so good! I save bread leftovers from our homemade bread in the freezer for bread pudding. I’m going to have to try this one! You take the best food photographs! That recipe looks great, I’ll have to investigate that book! Thanks for the inspiration! Of course, I need get this book now. Looks great, original and tasty. I’m always on the lookout for anything made using local ingredients. It looks delicious! I need to try this out; And I’ll have to look for that book! Ooooo a savory bread pudding. I love it! ps – you’re up on Tastespotting, #12656. Looking forward to seeing more mintyfresh over there. I swear I gain weight just ogling your creations! 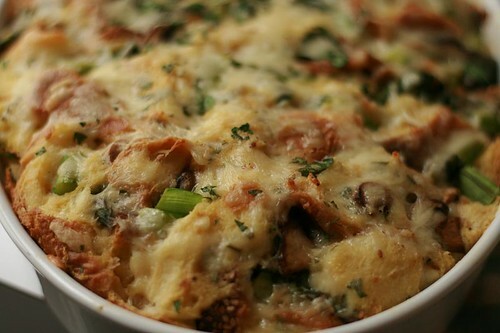 This savoury bread pudding sounds so good! Thank goodness I found you and this recipe! I’m not sure where I found it originally, I’ve been wowing my friends with this for a couple of years. Thanks, this will be at our Easter Brunch tomorrow.